Provided by the National Association for Court Reporters (NCRA), there are multiple certifications available for aspiring court reporters. The entry-level designation is known as a Registered Professional Reporter (RPR). Acquiring the skills and education to obtain the additional certification for a Certified Realtime Reporter (CRR) is a voluntary process that all of our court reporters have undertaken in order to ensure their high level of accuracy and competency in the courtroom. 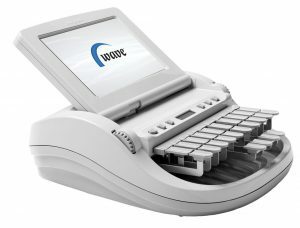 Court reporters are known for using computer-like machines known as stenographs. Stenographs look like a combination of a modern laptop and the control console on a blood-pressure cuff. The long, double tiered buttons provide court reporters with the ability to quickly take down phonetical sounds, which will later be reformatted into words with specific inflections and expressions attached. At BWF, our steno machines can be hooked up directly or remotely to the digital device of you choosing, allowing for immediate, streaming access of what is said and how it is said.